different configurations of the beautiful blue/purple centers. Are these separate varieties or are they the result of cultural practices? Is it possible that one might be fortunate enough to obtain them? Oh, I’m so jealous that you already have blooms on your Clematis florida ‘Sieboldii’! This clematis, with its beautiful white tepals and rich purple boss, is a species clematis, often grown from seed. Because the seedlings can vary somewhat, there are in fact slightly different-looking versions of the plant. Surprisingly, Clematis florida ‘Floro Plena’, a creamy white version version with a greenish boss, shows up occasionally among Clematis f. Sieboldii seedlings. There is also another version, Clematis VIENNETTA ‘Evipo006’, which is either a hybrid or a selected seedling produced and introduced into commerce by Raymond Evison. The only plant source I could find in the US is Brushwood Nursery (also called Garden Vines): http://www.gardenvines.com/shop/large-flowered-clematis-3/clematis-florida-var-sieboldiana-420.html. I’ve gotten both mine there. I also notice that Thompson and Morgan seed company sells seeds. Laura, Oren here. Thank you so much , so very much for the info you provided relative to the Clematis florida sieboldii and the sport sieboldiana. You were most generous. Do you sell plants? I am looking forward to your “blog posting” I know they must be informative as well as interesting. Thanks again for your help hope to chat with you again. Thank you, Oren, for subscribing to Clematis in Seattle! To answer your question, I’m sorry, but I do not sell plants. I do, however, recommend several retail sources for clematis (I usually buy from all of them every year!) 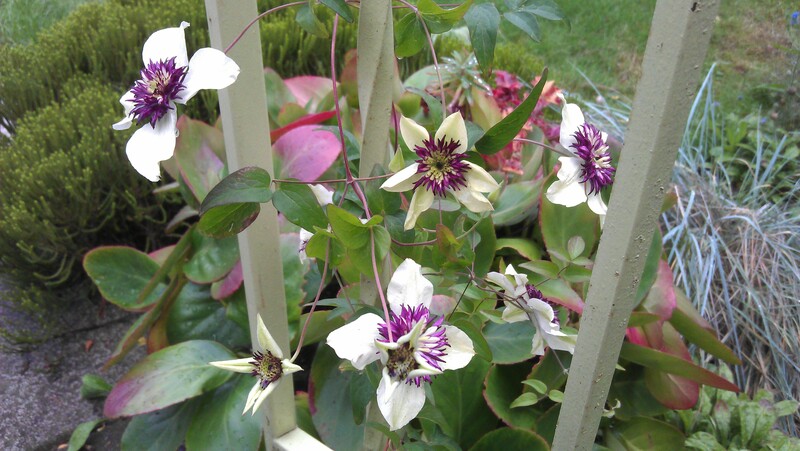 — check out “Great Sources for Clematis” in the left-hand column of my blog. It’s me, Patrick, again! 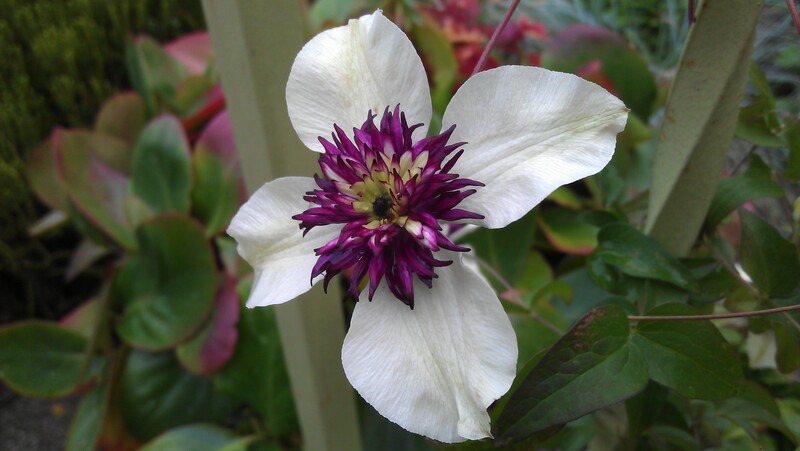 I’m looking at your photo of Clematis florida sieboldii, and would love to know how it is being grown. Is it in a pot? Are those wooden stakes I see ? Would love to know. It’s lovely. That particular Clematis florida ‘Sieboldii’ is grown in the ground. I wind it around the metal porch rails, which are painted a light greenish yellow. I have another in a pot, for which I use interesting wavy and contorted branches pruned from a Cotinus (smoke bush) that I cut back hard every year–great effect.